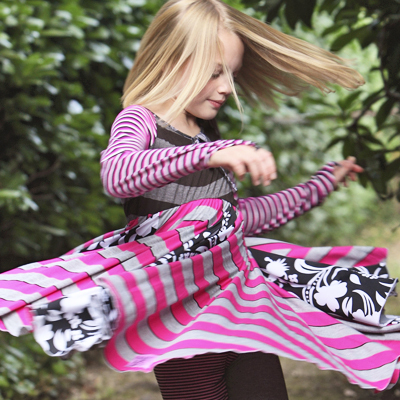 Fancy Dresses for Girls that are actually super comfy! Fancy these dresses! Here's the question we like to ask: What kind of dress will a girl want to wear more than once? Our answer is always this: A comfortable and fun one. These special fancy dresses for girls really meet the highest standards and beyond. Not only are they super soft with no itchy seams, but they are ultra Twirly® with vibrant contrasting prints and unique finger loops for that royal and trendy appeal. The end result is a fancy dress that is so comfortable, she won't have to wait for a special occasion to wear it. And unlike other fancy dresses, they don't require any special care or dry cleaning. Simply toss in the wash and tumble dry low or line dry. Easy as pie. This is dress she'll want to wear all the time! Once she tries it on and takes this fancy dress for a twirl, she'll be convinced that real magic was mixed to make this garment. Like all of our clothes, this dress is manufactured in limited quantities and numbered... just like art. That way she can be assured that her fancy dresses are just as unique as she is. So whether she's attending a real wedding, or the imaginary nuptials for a king and queen, she will be have an appropriate outfit for the event. Royal fanfare sold separately. Please be advised that this dress will be the envy of all who lay eyes on it. She may even be asked to demonstrate a twirl. If she is so inclined, spinning clockwise will delight all who see. Spinning in the opposite direction may cause her to time travel 4 to 5 seconds into the future. When she arrives in the future, she may appear disoriented or even dizzy. This is a natural side effect for those who quantum leap.